SNARE is a locally made film that’s aim, is to raise awareness of Rhino poaching in our country as well as the rest of the Africa, which will release on September 22nd, World Rhino Day. 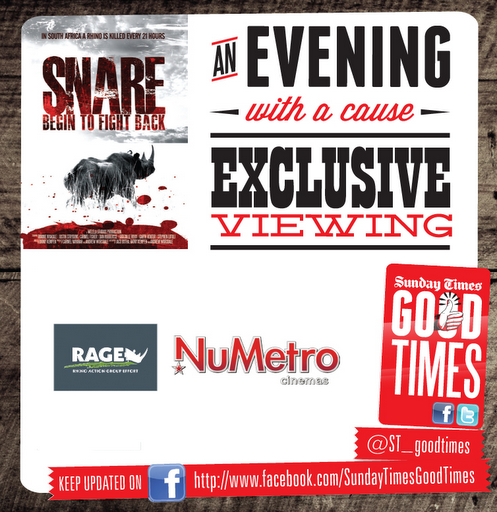 SNARE and Nu Metro have undertook a unique strategy whereby they offering screenings to businesses in South Africa, where the proceeds will go to RAGE (Rhino Action Group Effort). 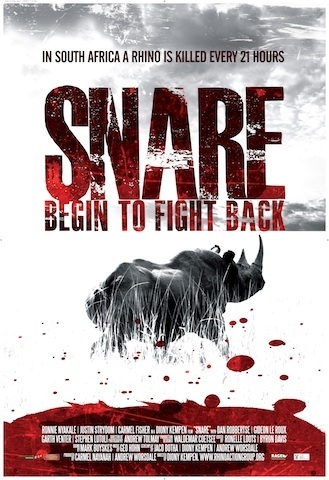 Nu Metro Cinemas and Nu Metro Films have pleasure in announcing a unique, innovative and customised release for the local film, SNARE - a gripping adventure thriller set against the backdrop of the Rhino poaching crisis, to coincide with World Rhino Day on September 22nd. Driki Mitchell, General Manager of Nu Metro Films says, “We realised that with this film it’s important to reach audiences who are committed to the cause and have compassion and empathy for the national tragedy that is happening. To that end, together with the producers, we are committed to finding partners and sponsors to bring SNARE to their members, subscribers and customers whilst also raising much needed funds for RAGE (Rhino Action Group Effort). RAGE supports the men and women on the frontline who risk their lives daily against the ruthless and heavily-armed criminal gangs who run the illegal rhino horn trade. By offering the opportunity to see SNARE, businesses are presented with a chance to play a role in the fight against Rhino poaching. With that in mind director Diony Kempen and producers Carmel Nayanah and Andrew Worsdale together with Nu Metro Films are committed to a unique, customised distribution strategy for SNARE where businesses are invited to book exclusive screenings of the film for their staff, members and client base at select Nu Metro cinemas in Johannesburg, Cape Town, Pretoria, Durban or Nelspruit on the weekend of September 22nd and for a month after. “Lured by the promise of a quick buck, local game farmer Basie van Tonder strikes a shady deal with Armand, a ruthless arms dealer with interests in the illegal rhino horn trade. To sweeten a contract with an Asian customer, he needs forty horns in four weeks. A fresh crop of gruesome Rhino killings is set in motion, but as the impossible deadline approaches, Basie turns to Spoon, a traditional hunter, for help and in desperation he frames a stranger who came to the bushveld hoping to find a piece of heaven. In South Africa a Rhino is killed every twenty-one hours. This film is a response to this crisis – but it’s not a dogmatic environmental plea for help. SNARE is thrilling entertainment that will make audiences think about the genocide of one of Africa’s greatest species. Combining dramatic narrative with sweepingly beautiful photography of the South African bush and intense documentary sequences that are integrated into the story, the film will thrill, provoke and inspire all who see it to finally stand up for a species that, if we do nothing, will soon not walk the earth. Block bookings – minimum of 30 seats per booking at R50 per ticket. Confectionary will be offered at a special rate for these business to business bookings. The filmmakers decided to meet this challenge and from very early on decided that a percentage of the proceeds from the film should go to anti-poaching campaigns in some form or another. The dilemma they faced was to whom or what organisation as nowadays there are so many ‘interested parties’ lobbying for the cause of the Rhino. They found a solution when they showed the film to the core members of Lead SA’s Rhino Action Group Effort (RAGE) and they decided that the film had the credibility and the strength to help the cause. The benefits of teaming with RAGE will ensure that any funds raised by SNARE will be going directly to the fight against Rhino poaching. RAGE (Rhino Action Group Effort) was set up by LeadSA to assist in the fight against the illegal rhino poaching scourge. Specifically, RAGE was designed to be a safe conduit for public contributions to this cause, whether they be financial, material or in the form of skills and information. 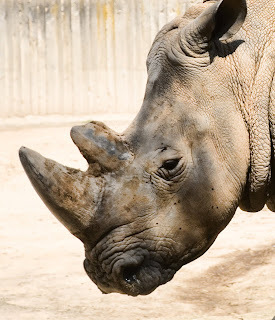 There is evidence that there is a huge groundswell of public support for campaigns to protect the rhino, but that many people are deterred from contributing either because they are unable to decide which of the many rhino-related organisations they should support, or because they are afraid that their donations may be diverted into the wrong hands. RAGE was therefore conceived as a safe haven for public contributions, so that people can with confidence turn their anger into effective action. RAGE does not directly carry out work on the ground, but supports those who do. When contributions are received, whether monetary or in kind (or expertise), RAGE's committee of volunteer experts (ecologists, game reserve owners, members of government, media professionals, economists etc.) collectively decides where they can best be utilised, and KPMG ensures that the process of transferring the funds is carried out correctly and that they are properly accounted for to LeadSA, to the Minister of Water and Environmental Affairs, and to all other interested stakeholders. RAGE mounts campaigns to build public awareness of issues associated with rhino poaching, and lobbies appropriate authorities for support. RAGE has the full support of the South African Police, and of South African National Parks. 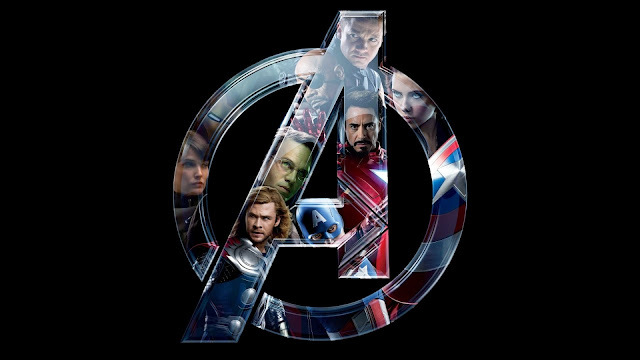 WHAT WILL WE SEE IN THE S.H.I.E.L.D. TV SERIES?? COULD JCVD RISE TO THE TOP AGAIN? ?